Have you had some stumbling blocks creating plans that get executed at retail? So you've completed an incredible category analysis, derived compelling data insights and tied in your analysis with some tactical changes to drive action in the category. Whether these are formal category plans for retail, or tied in with a new product launch or new news about a category, your work isn't done—now it needs to be implemented. Get ready to learn how to create a category plan that kills it! How many of you have either approved a plan at your desk (as a Category Manager or Buyer) or been given approval for the plan (as a Salesperson or Category Management Analyst), but it never ends up being successfully implemented in stores? I think we all have! Implementation of the plan in retail stores is a big barrier to overcome, as there are many obstacles that block it along the way. We've put together a 3-step process to help you create amazing category plans and then tie in with a strong implementation plan. If there are problems in any of these steps, your chances of successful implementation of your plans decrease. Planning up front is key to the success of your implementation plan. 1. Make sure your category assessment is thorough. The category assessment needs to address some key questions that you can refer to in the diagram above. 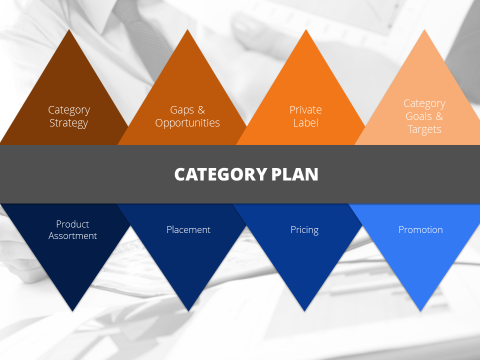 Many Retailers have a category review process to develop the Category Plan. It starts with the gathering of data, sometimes through standard templates and data sources. Next, the category assessment is completed, with gap opportunities and tactical analysis completed, with a resultant SWOT analysis. A preliminary category plan is then completed, with some type of final presentation being made to the Retailer for approval. This structured process results in the output of a plan based on a rigorous analysis conducted as part of the category assessment. For some Retailers, much of this category plan development is owned by a key supplier in the category, usually in the position of a vendor advisor or category manager. This approach should also be used behind new product launches or when there are significant changes being recommended within a category (through a new consumer decision tree, new Shopper data, etc.). The category plan should address all of the key areas of Category Management, and will ultimately result in a category plan document, including “how it works”. The key areas that should be included in the category plan include category strategies, gaps and opportunities, private label and category goals, and targets. These dimensions provide the current situation for the category, as well as the objectives for the future. Next, each of the tactics should be captured in the category plan, including product assortment, placement, pricing, and promotion. Don’t forget to loop back all of your decisions (as a Category Manager) and/or recommendations (as a Category Management Analyst or Account Manager) to the overall strategies for the Retailer. If you don’t consider this and align your recommendations to the overall strategies, this can be a huge barrier to the implementation of the plan. Once the category plan is developed, it needs to be implemented. This is where the plan “gets legs” and comes to life in the retail stores and at the shelf. It’s also where many more retail departments get involved, so coordination and communication to everyone from corporate through store staff is required. If a retailer cannot successfully execute the category plan in their retail stores, then the plan will not be successful. As a Retailer, the more you prepare for the implementation of the plan, the better the store execution will be. All cross functional teams—from both the Retailer and Supplier—should be engaged early in the project. This will help to keep communication lines open. Don’t introduce cross functions into the plan the day before execution. It needs to have senior management approval before it is communicated broad scale. It should include the effects that the plan will have on stores, including disruptions, costs, and the overall benefits of approving the plan. It should include a standard executive summary that is used broadly in your organization for consistency. The summary should include key findings from the category review, as well as the details of the implementation plan. It needs some type of reporting mechanism and an owner that ensures the plan stays on track (including a post evaluation plan). Make sure that you spend the time developing your implementation plan, including key owners for different pieces and strong communications to all those involved and affected by the changes. In summary, these 3 steps will increase the likelihood that your plan is implemented effectively in retail stores. For Retailers, there should be a standard implementation plan process in place for your Category Management team to follow. For Suppliers, you should understand how you can play a role in helping ensure the success of the implementation plan in retail stores. Looking for more information on Developing and Implementing Category Plans? 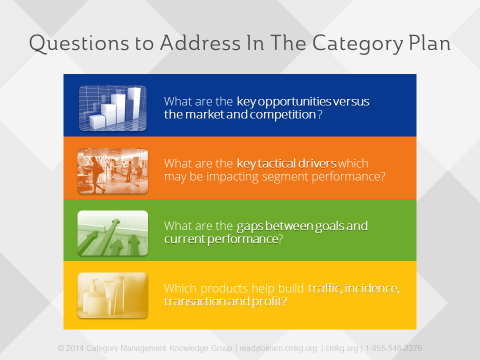 Category Management Knowledge Group can help you to learn more through a specific course or a customized program. Check out our accredited course on “Develop and Implement the Category Plan” or preview the course here.